At the close of baseball on Thursday, June 27, the Pittsburgh Pirates are in a crazy situation. No, they didn’t accidentally agree to go to their girlfriend’s sweet sixteen at the SAME TIME as going to their friend’s dad chance to become the WWF number one contender (that was Cory Matthews*). Even crazier, the Bucs have the best record in baseball, tied with St. Louis at 48-30. Generally speaking after 1992, you’re far more likely to find Bing Crosby’s old club in the basement than the penthouse. * That was the single most Bill Simmons-like joke I’ve ever made. I regret it now and vow to do better in the future. In honor of the Pirates’ outstanding performance thus far, I thought I’d take a look at the Pirates since 1992. This graph shows the coolstandings.com weighted playoff probabilities for Pittsburgh’s on June 27 of each season. Coolstandings.com calculates the weighted playoff odds using fancy-pants math to simulate the rest of the season millions of times. Because it’s using team performance weighted against opponents, this gives us situations like what we have today, where the Yankees, in third place in the AL East have a lower playoff chance than Tampa. Tampa’s remaining schedule favors them compared to the Yanks’ schedule, because it’s based on how they’ve performed, even though, record-wise, the Rays have been worse… seriously, look at this lineup– what a crappy collection of hitters). Anywhere the Pirates had a 15% chance of making the playoffs or better on the graph, I labeled it with their final record and standings. Rather infamously, Pittsburgh hasn’t finished better than .500 since 1992, when the lost their third straight NLCS. Sid Bream apparently killed a franchise. This graph shows just how dismal it’s been. 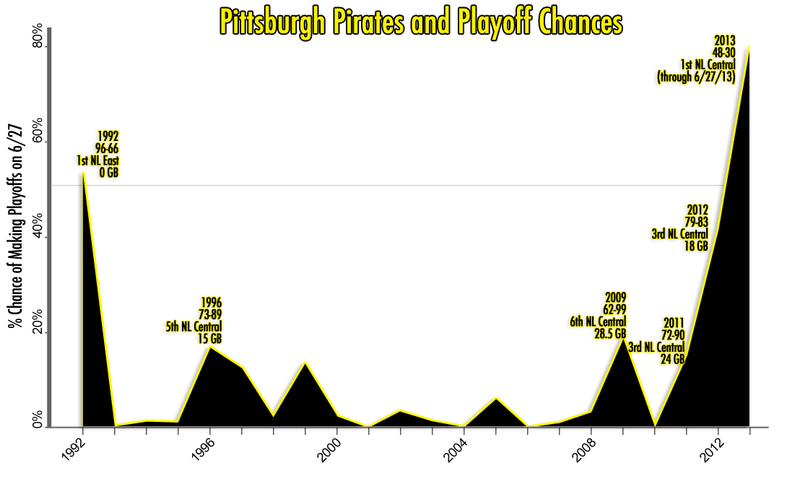 Between 1996 and 2009, on June 27, the Pirates hadn’t had a playoff chance higher than 13.6%. And in four of the last five seasons, the Pirates have had a respectable (as in, over 15%) playoff chance. The last few years, though, the Pirates have done surprisingly well, at least in the early going, only to fall so rapidly and so Pirately in the second half. Of note: in 1995, a third division was added to each league, along with a Wild Card, and in 2012, a second Wild Card was added. 1992 is included only as a reference to the Pirates’ last winning season, even though making playoffs from 1992-1994 (despite no playoffs in 1994) was much harder than 1995 through 2011, and even harder than 2012. In 2009, the Pirates were crappy. Plain and simple. But so was the NL Central. On June 27, the Pirates sat in last place at 35-39, but only five games out of first, behind the Brewers. The Buccos had a 18.8% playoff chance, despite being four games under .500. Part of that is the NL was crappy, by and large. Not only were the six teams in the NL Central separated by five games, the Pirates were five games out of the Wild Card, where only Arizona and Washington were double digit games out. The Pirates, naturally, would never be as close to either the Division or the Wild Card again, as they’d go on to record a 27-60 record to finish the season. That is crappy. In 2011, things were rosy, but somewhat superficially. On June 27, 2011, the Pirates were 39-38, with their weighted playoff chances at 15.1%, and they sat in fourth in the NL Central, four games behind the first place Brewers. Their peak win percentage and playoff odds came following a 12-6 streak, the Pirates sat at 51-45, in first place and enjoying a weighted 40% playoff chance. They actually were tied with St Louis for first as late as July 25. But a second half record of 25-47, including an 8-22 August (ouch). How could they only have 40% chance of making the playoffs while in first after 100 games? The Cards had an easier schedule (hence a 41.4% weighted playoff chance, vs the Pirates’ 29.3%). The Brewers (the eventual NL Central champs) were only a half-game out. The Reds only four games out. The Pirates, despite being in first in the Central were 4.5 games out of the Wild Card. The Atlanta Braves 2011 (and the Red Sox) is a whole other adventure in playoff chances. Last season, the Bucs actually had a good chance. On June 27, 2012, they had a 39-35 record, two games behind the Reds (41.3% weighted playoff odds). They actually had first place as late as July 5, and, after going 15-5 after June 27, were 54-40, a half-game behind the Reds and enjoyed a their peak playoff odds of 82.1%. They were even 2.5 games back on August 8 (with a weighted 74.6% playoff chance). As you can see by their chart, they started losing rapidly thereafter. In fact, they clinched a twentieth straight losing season on September 30, when they lost their 82nd game against the Reds. In 2013, the Pirates are a far more balanced team than before, rather than Andrew McCutchen and a bunch of other guys. Their pitching is first in the NL in ERA, BAA, Runs Allowed, fourth in Strike Outs. Offensively, they’re lower half, 10th in Runs Scored and OPS. At +36, they are third in the NL Central in Run Differential, fourth in the NL. They have the misfortune of playing in the same division of the Cards and Reds, first and third in Run Differential. St Louis is first in Runs Scored and third in Runs Allowed, so it’ll be tough to keep up. But this is (literally) the best chance they’ve had in decades). Tim is an orthodontist by training and trade. He also writes, performs comedy, is a part time (generally unpaid) artist, and once did the art design for a iOS game (dontfrythefrog.com). He enjoys baseball and movies, which is often what he writes about, and he tries to do so in comic fashion. He has interviewed for Jeopady! several times in the last 8 years, and still hasn’t been on; if you know the secret, please tell him. You can visit him at tpxdmd.blogspot.com, follow him on twitter @tpxdmd, and listen to “Saturday Morning Deathrgip”, a bimonthly podcast about 80s and 90s cartoons he co-hosts- saturdaymorningdeathgrip.com. He also won $32,000 on Who Wants to be a Millionaire?, but he downplays that for some reason. Posted on June 27, 2013, in Baseball, Tim. Bookmark the permalink. Leave a comment.